Aside from having installed thousands of these roofs, I have traveled the world to learn more before technically consulting to and teaching architects, engineers, roof consultants, metal roof manufacturers, trade groups and industry professionals on the topic. In 1991, I began inventing new and unique technologies to securely mount all kinds of things to these roofs while preserving the roof’s integrity and conforming to the science that I had learned. With 47 years of all that behind me, I am still learning. The commonality of corrugated and most (not all) trapezoidal roof profiles is that they are face-fastened, but that’s about where it ends. Every other aspect of these roof types varies widely. Not surprisingly, face-fastened means that the fastening to the building structure is accomplished by driving a fastener directly through the weathering surface of the roof panels. This is the characteristic that differentiates this metal roof type from its counterpart standing-seam, which uses concealed fastening. Interestingly, metal roofing has been in use for almost 3 millennia, so, relatively speaking, the 200-year old concept of face-fastening is new. Depending on where you are in the world, even the terminology is different, and so pierce-fix, exposed-fix, through-fastened and face-attached are all terms that are synonymous with face-fastened. 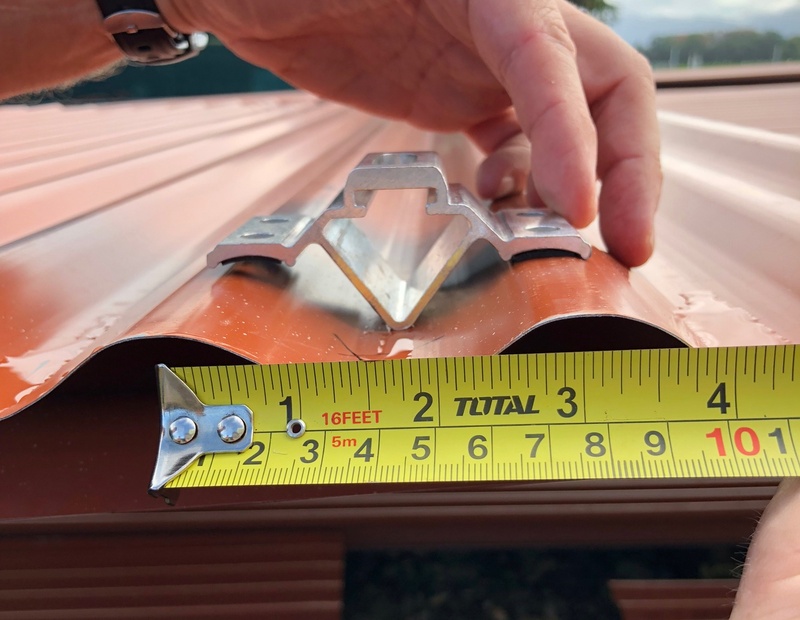 Although face-fastened profiles may all look similar to a casual observer, the spectrum of shapes and dimensional differences in corrugated (and other metal roof profiles), along with material type and gauge thickness are from soup to nuts. 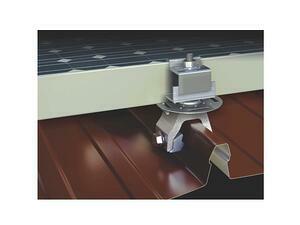 This becomes a very critical thing to know when affixing solar arrays to these roof types. 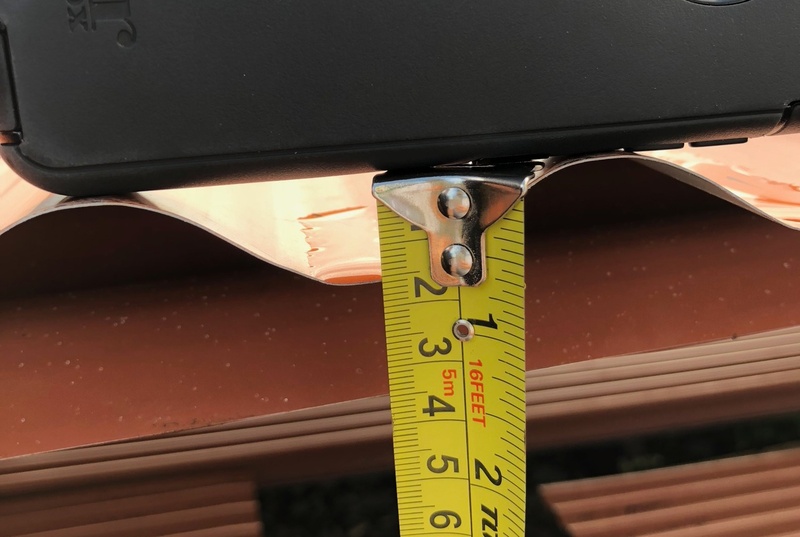 As much as we would like it to be, there simply is no “one size fits all.” At least not when doing it “the right way,” which involves preserving roof integrity for the life of the roof. Incidentally, that roof life may far exceed the life of the solar array. The corrugated profile, which has been manufactured since the early 1800s and the first to be produced through mechanized means, is still quite popular in many areas of the world, most notably Austral-Asia and developing nations in Southern hemispheres. While it has always been an economical, utilitarian roof profile, it is also making a comeback in the domestic U.S. market in architectural applications capturing the quintessential appearance of old industrial and farm buildings. In Australia and New Zealand it is still the gold standard of roofing for residential and light commercial application. Today, corrugated roofing is fabricated from many metals ranging from zinc and copper to aluminum and coated steel. (See Rheinzink, McElroy Metal and Lysaght catalogs for more examples.) It also sports different “pitch” and “rib height” dimensions and material gauges. Pitch is the dimension between adjacent ribs (crests, ridges). Rib height is the dimension from bottom of valley to top of rib. (that dimension ranges from 1/2-in. to 2-in. or more. Gauge references the thickness of the metal (with steel, the smaller the gauge number, the thicker the material). Because the corrugated profile is always symmetrical in the rib-to valley aspect, it is normally referenced only by its rib-height dimension together with its gauge. While, thinner gauges are generally more popular (28 to 22), I have seen corrugated sheets outside this range and in thicknesses of up to 12-gauge steel. This is about 0.10-in. (2.6 mm) and weighs about 5 lb/ft2 (24 kg/m2). In contrast, 30-gauge is 0.015-in. in thickness, so one is almost seven-times the thickness of the other. Such a broad statement is errant, as the “profile” is variant as to its dimension, thickness, structural capacity, flexural strength and load-bearing characteristics. This is true of corrugated or any other metal roof profile and depends on all the factors explained above in addition to the applied loads that each attachment must resist in both negative and positive load directions (wind uplift and snow respectively). It is therefore also dependent upon the frequency of fastening and tested holding strength of each point of attachment. A unique difference between metal and other roof types is that all metal panels are “structural” roof coverings. This means that they are potentially capable of carrying both positive and negative loads from points of solar attachment to the supporting structure beneath. 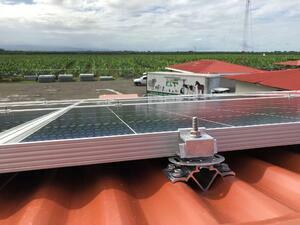 This is one attribute that actually makes metal a preferred mounting platform for solar. The solar contractor is released from the confinement of finding structural locations in many (if not most) cases. Whether using solar panel mounts via rail, rack or direct attachment, this is much more convenient to the designer and installer. Selecting the most appropriate mounting methods can also save serious money. But this also requires a little more in-depth knowledge of these roof types. On another related topic within the SPW article: fasten in the high or in the low? The article infers that the right way to fasten these roof types in in the high. The specific fastener location of these roofing types as they are anchored to the building structure varies, hence solar attachments should likewise reflect at least the same level of technology exhibited by the roof in question. In Grandad’s era, these roof profiles were commonly attached to the structure with “lead-head” nails. The lead washer added beneath the nail head provided some crude but imperfect weather protection to the hole created. This mandated that the fastening location be at the top of the rib for obvious reasons. Gauge numbers, although still commonly used in reference to metal sheet thickness in the U.S. marketplace are discouraged by the metals industries in preference to decimal inch or metric equivalences. Evidence of such testing should be requested of the mounting device manufacturer. Prudent system design cannot be done without it. If the vendor cannot furnish it, it is likely that it hasn't been done. The number of untested or inadequately tested products on the open market is in the author’s opinion, shameful. After the use of rubber-washered screws came into play (mid-1900s) this fastening location began to change. Fastening in the low provided much more structural integrity, diaphragm stability and reduced flexural fatigue and embrittlement of the fastener. But synthetic rubber chemistries in the ’50s were not the greatest and driving tools often over-compressed the washer causing failure. Beginning in the late 1970s, improved washer chemistries, e.g. EPDM (Ethylene Propylene Diene Monomers), and protective screw head designs became widely commercially available as well as better driving tools. Fastening in the valley with an appropriate washer-head screw has now proven a reliable solution for more than four decades. Such fastening is commonplace and the norm in the U.S. domestic market (in many other global markets it is still considered complete heresy). The supposed preference to fastening at the high involves what I call “roof culture” which varies geographically, and in accordance with roof installers’ experiential and handed down preference, often taught by grandfathers of another generation. The U.S. metal building industry has fastened in the low for more than six decades now, with hundreds of millions of square feet of such metal roofing installed annually. The U.S. solar industry is largely influenced by European producers. Notably, fastening in the low (rather than the high) is still considered heresy in European roof culture, so there is a preference within the solar trade that is somewhat biased. None of the commentary on this particular topic implies a “right” or a “wrong.” It simply means that when mounting solar, one should follow the roof culture and technology that is exhibited on the roof to which they are attaching. Metal Panels Do Not Leak—It’s the Holes! Another vital ingredient to success is the science of the waterproofing of any solar attachment. Appropriate waterproofing of any making of holes should be validated by testing in accordance with ASTM E2140 to ensure against leakage. Products that are promoted to “fit all profiles” are particularly subject to this scrutiny. Most will not pass it. Remember that this ASTM test is only valid for new material., so to be consistent with the expected life of the roof and solar system it should be time-proven material. We suggest high quality EPDM closed cell formulations in durometer of 40-45 when attaching somewhere in the high. And make sure it is black in color. This is because carbon black is the best know UV inhibitor. Nevertheless, rubber of any chemistry is subject to age degradation so it should be protected from exposure to the greatest extent possible. Be assured that there are all kinds of alternatives, and many open-cell foams are being used in the marketplace currently that will disintegrate from heat in fewer than 10 years of service on a rooftop. Most of these formulations are heat degraded and will turn to powder. Read this information in the sealant technical and performance specifications. Request those from the mounting system supplier. Evidence of such testing should be requested of the mounting device manufacturer. Assurance of no leak is proven by it. If the vendor cannot furnish it, it is likely that it hasn't been done. The number of untested or inadequately tested products on the open market is in the author’s opinion, shameful. I have spent almost half a century contracting and consulting within the metal roofing industry and I have instilled these tenets throughout the entire S-5! organization. Over our 26-year company history, we have developed numerous products that follow them and have been awarded more than 50 patents following that innovative art. developed products to suit this broad range of variables in metal roofing to cover all the bases in the most prudent and economical ways possible. All our products are made in the U.S. in our own ISO 9000-15 certified plant and carry our standard 25-year limited warranty. 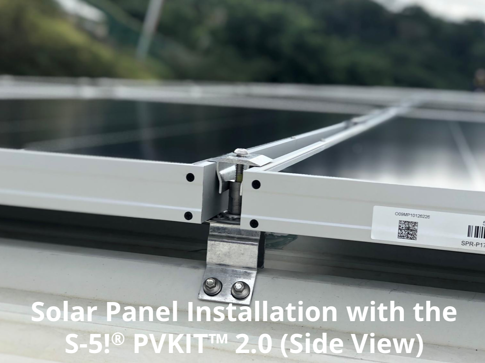 More specifically (and contrary to the inference of the article), our company offers five different options to attach solar PV securely to corrugated profiles—only one of which attaches in the low using an isoprene/butylene copolymer tape with four decades of proven reliability. The other four attach in the high with our own specially designed screws that maximize holding strength and stripping torque. Many of these are offered in both imperial and metric dimensioning. Also, contrary to the afore mentioned quote, they can be used at a structural location or to sheet only when load conditions justify. In the former applications (to structure), they have patented, state-of-art designs that prevent crushing of the ribs that may otherwise result from over-tensioning of fasteners. We also have done thorough load testing of all these options in different substrates and material gauges and publish those data right on our website so a user can design any system properly and in accordance with the many variables cited herein that vary from job to job. We would never even think to offer a product not tested in this regard. Incidentally, we also offer 10 different options for mounting to trapezoidal rib profiles (not to be confused or intermingled with corrugated profiles). An example of one of the 10 options was recently highlighted on a California solar project. It is also a good example of an engineered attachment to sheet only, taking to economic advantage direct attachment to a “structural” metal panel. The subject company, McElroy Metals, is a premier manufacturer of both corrugated and trapezoidal rib profiles and a scrutinizing user of solar attachments to its roofs. All 10 of our trapezoidal rib options comport with the standards of practice that I have highlighted herein. So, caution is advised when a vendor claims to have the “best” solution for all these profiles with one or two product offerings. Something is always compromised in the interest of versatility. It may be quality, optimal performance or optimal cost. That’s why we have 15 total options for these varied profile types. 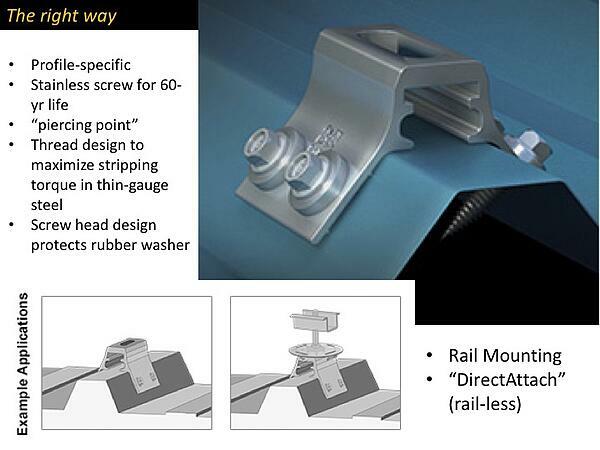 Some are more suitable for rail mounting, others for direct attachment, others for both. Above to the left is an exposed fastener attachment solution. 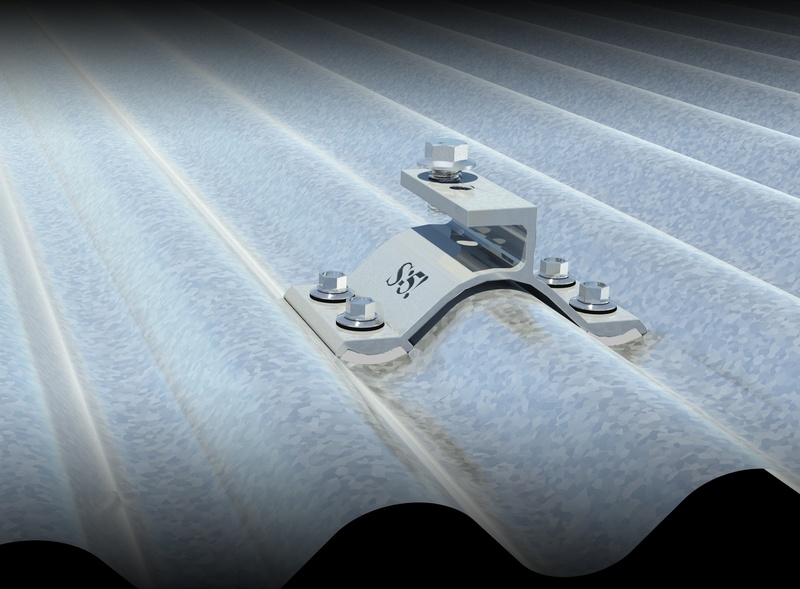 To the right, you will find a clamp-on solution for a hybrid trapezoidal roof. 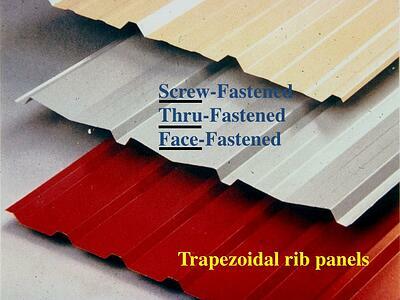 Some for corrugated, some for trapezoidal and still many others for standing seam. We are happy to tell our users the pros and cons of each—cost considerations included. The reduction of all these differentiators to a “one size fits all; fasten to the structure through the high rib” is potentially misleading to a buyer, who (we hope) practices their art in a more professional and scrutinizing manner. Metal roofs are unique. We have a 26-year track record attaching things to 1.9 million of these roofs, including almost 2 GW of solar in global installations without a single documented failure including exposure to 165-mph hurricane wind speeds. 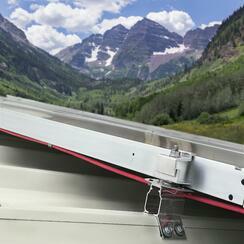 Our company carves our niche by making complexities simpler to our users on metal roofing projects. We can do this because metal roofing is our core competence and the only thing we do. We embrace that and have the credentials to prove it.